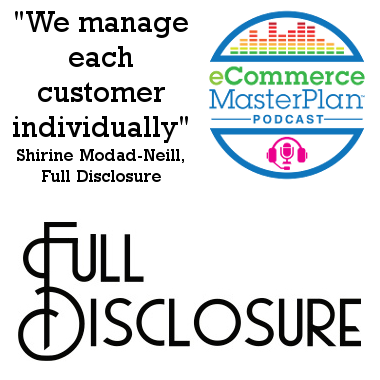 Shirine Modad-Neill is the founder of Full Disclosure a online fashion boutique bringing customers a curated selection of luxury lingerie, sleepwear and swimwear from established and under-the-radar designers. Launched in Aug 2014, with high price points, they now 1-2 orders per day, from £50-£2000 per order. Based in Copenhagen, ships worldwide. Most customers UK or USA. Shirine has worked in luxury and retail her entire career, although before Full Disclosure, she had never done eCommerce before. She was working for Louis Vuitton in Bahrain when she met an agent from a couture shop in the same mall. The manager of that shop got her interested in luxury lingerie. Shirine moved to the UK with Louis Vuitton a couple years later, and while there she discovered a lot of emerging designers in lingerie and sleepwear. After moving to the UK, she then moved to Doha, which seemed like a good time to also leave Louis Vuitton to start her own shop. She had originally thought of opening a brick and mortar shop, but could see trends in eCommerce developing and decided not to limit herself to a physical shop when she could go global instead. Listen to learn more about how the evolution of eCommerce led to customers being comfortable buying lingerie online, and how fitting guides help. A key asset of Full Disclosure is how they manage customer relationships. Every approach with every customer is unique and personal, which can be hard to do through eCommerce, since you’re separated from your customer by distance and a screen. However, in luxury and in lingerie, the contact has to be personal. It can be time-consuming, but it’s not something they will compromise on. As a result of their great customer relationships, they have a 30% repeat customer rate, and they are on a first-name basis with many of their customers. Listen to learn more about the importance of fostering great customer relationships. Shirine places the focus on building the relationship first before trying to sell anything, so after signing up at the site, each customer receives an automated welcoming email that lets them know three key things. The first is who Full Disclosure is and what they are about, the second is letting the customer know it’s personal and inviting them to contact Full Disclosure, and the third is that they ship worldwide. Those initial three messages were chosen because that’s what Shirine would want to hear if she was the customer. What does the customer need to know to be able to buy from you? Further emails are much less automated. As the relationship with each customer grows and they learn more about the customer, the communication with them becomes more personal. Listen to learn why it’s important to pick and choose which communications are automated and which are not. It’s going to be hard. Manage your expectations, because overnight success is rare. You have to earn your customers one at a time. Don’t be afraid to experiment, but be cautious with your money. Start small. It’s easier to start small and scale up than do it the other way around. Business – Sign up to the Full Disclosure email list for a special 10% discount offer. wow love this! may i know which shopify theme is the site using? looks beautiful! Hi Melia, I believe it’s custom… but I’ll ask Shirine to comment with the real answer! Thank you very much, really appreciate hearing that! It is indeed a custom build. I’m happy to connect you with my web developer Scott Couper. He’s based in Aberdeen and does freelance work, he’s brilliant!